Features and Benefits: Low modulus natural rubber latex allows for reduced hand fatigue over long periods of wear. Lightly powdered with USP absorbable cornstarch for easy donning. Longer length than typical latex exam gloves. Fully textured for a secure grip in wet or dry conditions. PowerGrip glove is an ideal choice for professionals needing a powerful grip. The PowerGrip glove provides excellent comfort, fit and feel. PowerGrip is longer and thicker than typical examination gloves, and is textured for a secure grip in wet or dry conditions. Greater thickness and a longer cuff offer coverage over the wrist and forearm, providing increased protection where it is most needed. 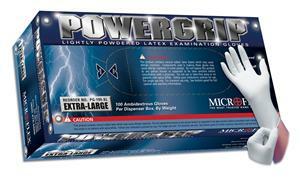 PowerGrip® meets or exceeds proposed FDA and current ASTM standards for exam glove quality and performance.